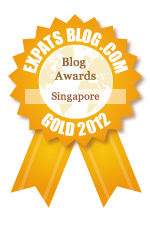 ExpatsBlog.com Expat Blog Awards 2012: Singapore Gold Award! This blog won the Gold Award for best expat blog in Singapore! I'm glad Diana has been recognized for her writing. I've been telling her for years she should be writing a book because she is clever, thoughtful, and fun to read. Tale of a Trailing Spouse is a wonderful traveling eye on the world! This blogger has a way with words and in just a few paragraphs we the readers are transported across the world. Its usually the small observations which tell the biggest stories and The Trailing Spouse does that so well. Reading this blog is like trailing The Trailing Spouse and makes one feel connected across the globe. Keep up the great blogging for those of us stuck a little closer to home. I've been reading Tale of a Trailing Spouse for quite awhile. I've even had the pleasure of meeting its wonderful writer several years ago. It's always interesting to read about the lives of others abroad, especially now that I am once again back in the US. Diane has a great way of getting a point across in a fun, and funny way. I've enjoyed reading her blog and look forward to hearing more about her adventures in Singapore. I've always wanted to visit there. Diana's blog is informative, light-hearted, and well-written. I have known her since 1984 and reading her blog is like sitting down with her to talk and laugh and ponder. As a new expat myself, I find the stories she tells parallel to my own experiences. Thanks, Diana for your insight and your sense of humor. As a new(er) friend and fellow expat living in Singapore, I didn't even realize that Diana had this blog! After reading some of her posts, I realize that how she writes on her blog, is just how she visits with me in person! I love it! Plenty of detail, friendly, informative, and of course, I could ask questions and insert my 2 cents if it were in person, but it's a blog. Love it, and love keeping company with Diana! Congratulations on your nomination Diana! It's we'll deserved. I always enjoy your take on expat life and look forward to each new post! Living abroad and haven't found a new BFF yet? Well, you just have. Diana's blog will make you feel that you have found someone going through the exact same things as you. And the best part is that her positive outlook on things will remind you that the best thing to do is smile when you are feeling blue. I really like to read Diana's blog. She has this wonderful way with words, makes you feel like you are in the experience with her.... She is very clever, and talented. As a tailing spouse myself, I often find her observations quite to the point and very helpful. I am very happy for her!! For some time now I read every post of "Tale of a Trailing Spouse". Diana writes about her experiences across the globe in a light-hearted and positive way. Her blog posts reflect the real situations expats finds themselves in when away from home. I would highly recommend this blog to any expatriate family. Diana has shared her engaging writing style with the world through several blogs. "Tale of a Trailing Spouse" has introduced me to places I've never had the chance to visit and what it's like to be an expat. Though her experiences are not ones that I have had, her true talent is showing how what we all think, feel, and go through in life is more similar than we often realize. I look forward to Diana's every post -- great reading!! Nothing makes me happier than seeing a new post. I love starting my day with Diana's musings, humor and perspectives. It's my moment to enjoy and ponder a world far away from my own. Great blog Diana, many congratulations on the nominaion. Maybe one day our paths will cross in Singapore. Good luck! Always a good read. Keep up the good work! So close to my own findings in Singapore and yet so far. I like this kind of expat blog! Reflecting not judging, which is really precious. Thank you. Fun and interesting blog written in a style that delivers subtle messages in a very accessible way. DianaÂ´s "easy to read" style engages you with each post. Her writting reflects her personality: Honest, caring and fun. I think she should write a column each week. Great blog Diana, I love your insights, news and comments. You say the things that others would just never admit to; Please keep on posting. i have enjoyed reading Diana's blogs and can also relate to them as we as a family have moved around quite a bit. i certainly have enjoyed meeting new people and seeing new places. Diana is a great writer--I've been reading her blogs before she became and ex-pat. It's been great to share the journey with her and get some insight to her life abroad. She's a great storyteller. Congrtulations, I always read them,when you were here in Barcelona and especially now that you are in Singapore,looks forwards to reading the next one's. Great blog. Very personal and honest. Well-conceived and well-written. Keep on posting! Congrats, Di, on the ongoing high standard of your writing and your blog. For a reader who travelled and then got stuck, you bring your experiences in Singapore (and other places) so wonderfully to life. Thanks to this blog, I've got to know better a lady who's got a great personality: she's generous, fun, and an excellent writer. I just wish she would write more often. Great job Diana! From the first post, I was hooked. I love Diana's writing style, there is always a twist of humour amongst the realities of being an expat wife. Well done. Love how close to home the posts are. Diana is a special, very talented lady (and blogger). I love this blog, but I like the writing style best. I always love reading about Diana's adventures. I met Diana's spouse almost 10 years ago. We considered becoming ex-pats ourselves in 2005...but never did. It's fun to stay connected and live the life--vicariously--through Diana's blog. It's a wonderful read! I love Diana's writing because it is very descriptive and funny. I met her in Barcelona and I have always enjoyed spending some time with her. I love her sense of humour too. So Diana keep on filling us your amusing stories and let us share your experiences. We love you!! Great blog to keep up with friends but also too what is going on the world and experience from and American point of view. Very insightful for those of us over here. Diana's blog is always fun to read! I love her sincere and descriptive writing style. Keep the stories coming! I recently found Diana's new blog and I am so glad I did. I missed her blogging since she left Germany a few years ago. Once you start reading one of her entries you notice her unique blogging style and you will come back daily to her blog to see if she has a new post. They are educational, thought-provoking and fun. Most times I think, I wish I could just hangout with her and have this conversation in person, but since it is not possible, I' m glad I get to "visit" with Diana through her blog. Thank you for bringing far away Singapore a little closer!